Shoeing of horses’ hooves is often essential but, unfortunately, not without risks. Accurate placement of the nails is essential, not only to ensure a firm hold within the wall of the hoof but also that the nail does not penetrate too deep, as this can irritate sensitive structures beneath, primarily the sensitive laminae. When the shoeing nail has been placed too close to the sensitive laminae this is called “nail bind” and, if the nail has penetrated the sensitive laminae, this is called “nail prick”. The first sign of a problem is lameness. This usually does not occur immediately but will be seen over the following few days after shoeing. Application of hoof testers or tapping the hoof around the nail will elicit pain. Also, if removal of the nail is attempted the horse may resent it. There is an increased digital pulse in the palmar digital arteries, which are located on the side, or lateral, aspect of the fetlock and can be felt by placing a finger over them. How can I prevent ‘nail bind’ and ‘nail prick’? Regular attention from a competent farrier will ensure that your horse’s feet are in optimal condition. Specific supplements are also available which can aid in hoof health; advice on the best treatment for your horse can be obtained from your veterinary surgeon. Cracks can occur in the hoof walls and can originate from either the hoof or the coronary band. Ones that originate from the base of the hoof are called grass cracks, whilst those that originate from the coronary band are called sand cracks. They can be either partial cracks extending only part of the length of the hoof wall or complete cracks extending the entire length of the hoof wall,such as those depicted. Grass cracks are more common and are usually caused by overgrown hoof walls or unbalanced feet. Sand cracks, however, occur due to an injury to the coronary band or as a result of abnormal stress at the coronary band caused by unbalanced feet. Hoof wall cracks are obvious to the naked eye but may also cause lameness. 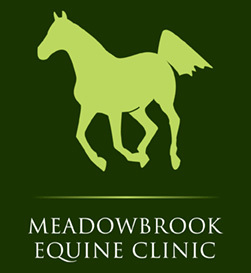 Grass cracks seldom cause lameness unless the underlying tissue develops a secondary infection or if the cracks extend to the coronary band. Sand cracks will almost always cause lameness however as they involve the coronary band. Regular attention from a competent farrier will ensure that your horse’s feet are in optimal condition. Specific supplements are also available which can aid in hoof health; advice on the best one for your horse can be obtained from your veterinary surgeon. The sole of the hoof is that part which is bordered by the white line and the frog. The parts of the hoof that normally contact the ground on an unshod horse are the dorsal wall (the hard hoof) and the frog. Normally, the sole of the hoof does not come into contact with the ground.What causes bruised soles? The most obvious sign of a bruise is lameness. The lameness usually develops as soon as the bruise occurs but may reappear the next day once the horse has seemingly recovered. The lameness should be confined to the affected leg and pressure applied with hoof testers should demonstrate the area of the sole affected. All horses’ feet should always be picked and thoroughly cleaned out before exercise. Exercise on uneven and stony ground should be avoided, particularly for thin-soled horses. Regular attention from a competent farrier will ensure that your horses’ feet are in optimal condition. Specific supplements are also available which can aid in hoof health, as well as protective hoof pads. Advice on both of these products can be obtained from your veterinary surgeon. Corns are simply bruises of the sole, which occur at the ‘seat of corn’. This is the part of the sole which lies between the bars and the wall at the back of the sole. Corns can be caused by a number of things that traumatise the seat of corn. Most commonly corns are due to either a too narrow or too tight shoe, which causes injury to the seat of corn. Stones can become trapped between the shoe and the seat of corn or the shoes can be left on too long and begin to dig in causing damage. Poor conformation, such as low heels, means that excessive weight is put on the heels and may traumatise the seat of corn. Lameness is the most obvious sign of corns. The severity of the lameness depends on how much damage has occurred. This lameness becomes more apparent if the horse is ridden on hard ground, in circles or lunged. Sometimes both front legs may be affected which can be difficult to detect. Pain can usually be elicited by applying pressure over the affected seat of corn. Regular attention from a competent farrier will ensure that your horses’ feet are in optimal condition. Specific supplements are also available which can aid in hoof health, as well as protective hoof pads. Advice on both of these products can be obtained from your veterinary surgeon. This is the most common cause of lameness in the horse. The lameness is usually confined to one leg and clinical signs will occur suddenly, sometimes during exercise, when the animal has not been lame to begin with. 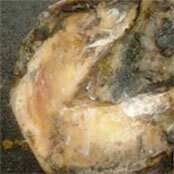 The severity of the lameness is determined by the amount of pus produced and whether it has a means of escape. If there is no drainage, the pressure of the pus builds up between the sensitive layers of the hoof resulting in inflammation and pain. Pus in the foot is simply due to the presence of bacteria and other germs within the foot causing infection. The bacteria are introduced into the foot either by a puncture wound (e.g. Nail prick) or through a crack in the white line or hoof wall. What are the signs of ‘pus in the foot’? The first sign of ‘pus in the foot’ is lameness, generally in one leg. This may be only a slight lameness initially but can develop to the extent that the horse is reluctant to bear weight on that leg. As pain in the leg worsens the horse may sweat and blow and can even be reluctant to eat. The leg, in particular the hoof, will feel warm to the touch and, when palpated, the digital pulse will be strong or even bounding. 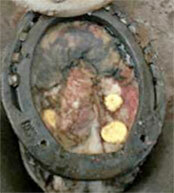 The site of infection can usually be identified by applying light pressure with hoof testers over the sole. Pus may even be seen to ooze from the site of infection. Occasionally, if severe, the pus will migrate upwards and burst out at the coronary band or track along the sole leading to a condition called “under-run sole”. The shoe will need to be removed to allow an adequate examination. How can I prevent ‘pus in the foot’? Your horse’s feet should always be picked and thoroughly cleaned out before exercise. Exercise on uneven and stony ground should be avoided, particularly for thin-soled horses. Regular attention from a competent farrier will ensure that your horse’s feet are in optimal condition. The equine foot is a tough structure which helps protect the sensitive structures beneath, and the hoof wall is similar to the human fingernail. Puncture wounds to the foot can range in significance from none at all to a severe life threatening injury, depending on the site and depth of penetration of the wound. Puncture wounds usually occur on the sole of the hoof although can sometimes penetrate the walls.What causes puncture wounds? Generally speaking, the deeper the penetration the more likely it is that an important structure is affected. For example, if the wound penetrates to the pedal bone, it can cause a bone infection and may even fracture the bone. The most serious injuries are those to the back half of the foot. These may penetrate the navicular bursa and could even involve the coffin joint and cause a joint infection or damage to important tendons. This type of injury is very serious and can be life threatening. If you discover a puncture wound to your horse’s foot, you should immediately contact your veterinary surgeon for further advice. Do not necessarily remove the foreign item if it is still present since it may be beneficial for your vet to radiograph (X-ray) the foot with the foreign body in place to gauge the extent of the penetration. Follow your veterinary surgeon’s advice. It is important that an accurate diagnosis and appropriate treatment is administered as soon as possible to avoid further complications and potentially life threatening situations developing. It is also important that your horse has regular tetanus vaccinations as puncture wounds are an ideal route for tetanus to infect your horse. Advice on vaccination can be sought from your veterinary surgeon. Thrush is a condition affecting the frog of the foot, which can result in lameness of the affected limb.What causes thrush? Thrush usually develops due to poor hygiene, failure to clean out the feet regularly or if the horse is kept in damp and dirty conditions. As the hoof is continually damp and dirty it allows bacteria and fungi to invade, causing infection. The part of the hoof affected is the sulci or grooves of the frog, of which there are three. One bacterium in particular, Fusobacterium necrophorum, is particularly nasty and will eat away the layers of the frog and expose the deeper more sensitive tissues. Horses with deep sulci are much more prone to developing thrush. Horses with long toes and contracted heels will tend to develop deep frog sulci. Canker is a more serious form of thrush and alters the normal growth of the hoof wall. Thankfully nowadays it is rarely seen and is most often seen in horses kept in wet tropical climates, or in large draught type horses. Canker affects the hind legs primarily.What causes canker? Canker generally originates in the frog and can be mistaken for thrush in the early stages. Whilst thrush is limited to the sulci or the base of the frog, canker invades the horn of the frog anywhere throughout its structure. Canker also causes the hoof tissues to grow excessively, whereas Thrush destroys them. 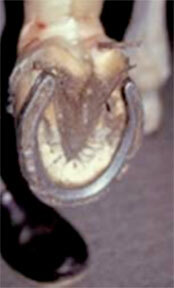 Lameness is not usually associated with Canker early on but horses may stamp their feet due to the irritation. As the disease progresses, lameness may develop depending on the severity of the condition. The lower limb may also begin to swell as deeper tissues become involved in the condition and become inflamed.